So it’s been roughly a year for Constance Kopp working as the ladies’ matron for the Bergon County Jail. In that time she has investigated crimes, tracked down murderers, sought justice for women of all walks of life, and put her life on the line more than a few times. She’s gained nationwide notoriety, and caused more than a few scandals at home. About now, some of those scandals are coming back and are in the forefront of local elections. Because of New Jersey law, Sheriff Heath, Constance’s boss and chief defender, cannot run for another term of office without taking one off — so no matter what, after Election Day, Constance will have a new boss. Heath’s former Sheriff is running for the position again, and is the expected winner. He finds the idea of a female deputy silly, and while he won’t take Constance seriously, he’ll probably leave her alone. His opponent is a current detective in the Prosecutor’s office who has been opposing Constance’s position and person since Day 1, he’s essentially running a campaign against Heath (even if Heath isn’t the opponent), and Constance is the easiest way to do that. Clearly, the future isn’t bright for Deputy Kopp. While this is going on, Constance makes a couple more headlines — she runs down a burglar single-handedly, she jumps into a river to apprehend a potential escapee under their custody when another deputy is injured. 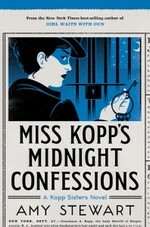 Constance has to take a woman to an insane asylum, after her husband and doctor get a judge to commit her for a while. This isn’t the first time this has happened to the woman, and it seems clear to Constance that this woman is as sane as anyone. So Constance attempts to find out what’s behind this commitment so she can free this woman. She’s very aware of the trouble that this could cause for herself and for Sheriff Heath, she tries to do this under the radar. Under the radar isn’t something that comes naturally to her, and her results aren’t stellar (but better than one would expect). The story was a bit flat, honestly. A lot of things seemed to be foregone conclusions (not necessarily the way that various characters saw them working, either). The one case that she really gets herself into is really pretty tidy and doesn’t take a lot of effort — although she does take plenty of risks. 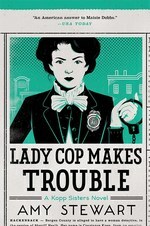 So really, the novel isn’t about Constance sinking her teeth into a case, into helping a woman through some sort of problem, or any of the usual things. This is primarily about Constance worrying that she’ll do something to jeopardize Sheriff Heath’s Congressional campaign by giving his opponents something to harp on, while contemplating her future in the jail under the upcoming term of office for either candidate. Which is fine, really — it’s just not what I’ve come to expect from these books — I expected the case of the poor committed woman to take the bulk of the attention, so the problem is my own. But it comes from being conditioned by the previous books. Constance’s sisters have a background role in this book — Fleurette in particular, she’s around frequently, but she plays a very small role. I appreciate that she seemed to have her head on straight and wasn’t the cause for trouble (inadvertently or purposely). Norma seemed to primarily be a conduit for comic relief in this novel. But it never feels right to laugh at her, she’s the most practical, she’s the only realist in the family — it’s her blood, sweat and tears that’s kept the family going. On the other hand, her obsessive nature does lead her into some strange preoccupations. This is not to say it’s a bad book — Stewart is probably incapable of writing a bad book. 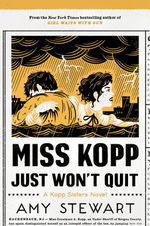 Miss Kopp Just Won’t Quit feels very different than the others in the series (although, really, each has felt different than the others), and it left me feeling dissatisfied. Still, it was an entertaining and compelling read. The ending is likely the best the series has had thus far — we just have to go through some meandering passages, and some dark times for our favorite Deputy before we get to it. I don’t know what comes next for Constance Kopp (I’m deliberately not consulting anything to tell me, either) — but it’s going to be very interesting to see what Stewart does next. 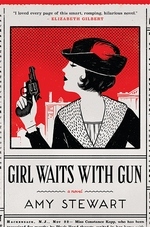 Without meaning to slight Girl Waits with Gun or Lady Cop makes Trouble, this is the best constructed novel in this series. There’s a unity of theme, stories that complement each other, and a level of (honest) introspection from the characters that we haven’t seen before. That said, I don’t think I enjoyed it nearly as much as I did the others. So it’s a little bit of a trade-off. We are treated to three stories of young women, one sixteen year-old and two eighteen year-olds, who leave home for various reasons. They all want something more than they can have at home — meaning, a job, excitement, freedom, and maybe something more. One girl did everything right, but sill was arrested for waywardness. One was pretty foolish, and did some illegal things, but was really arrested for the foolish mistake. The third was Constance’s little sister, Fleurette. Constance went to bat for all three — interceding with the law (when applicable), with family (when she could), trying to give them the ability to live the life they wanted to — and each of them pressed Constance’s ability, job and standing as she did so. While this is going on, Constance is making headlines across the nation — making her both a distraction to her friend the Sheriff, as well as a voice for social change. I know she regrets the former, and I’m not convinced she relishes the latter. If she had her druthers, I think Constance would prefer just to do her job and be left alone. But she is learning how to use her notoriety — or at least her relationship with members of The Press — to help her accomplish her goals. Constance begins to come to terms with some very unfortunate realities of her life, and begins to grasp what the future may hold for her, both professionally and personally. In some way (I think), she thought she could keep the life she had and just add on her job on top of it. But between her fame, the time she spends away from the home, Fleurette’s aging and getting ready to leave the nest, and everything else going on around the sisters, that’s no longer possible. Her old life is gone, and the new one is too in flux for her to get a handle on it. Assuming that there are more Kopp Sister novels to come, watching Constance figure out what her life will be — and hopefully she gets a hand in shaping it — will be the key to the series as it progresses. On the whole, this one didn’t work as well for me as the previous books did. But several of the individual elements I found compelling and wanted more of — I wish we got more of the story about Edna Heustis (I don’t need to know what happened over the rest of her life, I just want a clearer picture of the next few months) or her roommate. I’d have liked more interaction between Constance and her boss — we just didn’t get enough of them — and an honest conversation about the future would’ve been nice. I did think the ending of the Fleurette story was handled perfectly — I don’t think I’d change a thing about that whole storyline, really. Still, this novel was somehow less than the sum of its parts, for me — but I can easily see where I’ll be in the minority for thinking that. I’m not saying I didn’t enjoy it, I just should’ve enjoyed it more. Strong characters, some strong themes (ones you usually don’t see in Detective fiction), and a tumultuous time period (for several reasons) combine to deliver another satisfying entry in this series that’ll please existing fans and probably pick up a few more. It’s 1914. Constance, her older sister Norma, and much younger sister, Fleurette, live on a farm in Northern New Jersey. They’re out for a drive into town in a carriage when an automobile slams into the side. Everyone escapes fairly unscathed, but rattled. Well, the ladies are rattled, the driver of the car, Henry Kaufman, and his companions are annoyed that the Kopps had the temerity to be on the road, much less be struck by a car. Constance demands payment for repairs, but Kaufman brushes her off. But Constance is persistent and begins to annoy Kaufman, who’s notorious for busting a strike the year before (and should be notorious for worse). And when Kaufman gets annoyed bad things happen — a campaign for intimidation begins against the sisters. Soon it becomes a battle of wills — Kaufman’s arrogance and pride vs. Constance’s gumption, stubbornness, and sense of right. Constance soon learns of more of Kaufman’s crimes and abuses, meeting other victims — who warn her just how bad things can be. While she tries to withstand Kaufman’s assaults, she begins to try to help other victims. At the same time, she befriends the local sheriff, one of the rare lawmen in the area who aren’t beholden to Kaufman and his peers. There’s a lightness to the writing, but the subject matter is grim — and frequently uncomfortable. Whether it’s the persecution of the sisters, Constance’s investigation into Kaufman’s misdeeds, or Stewart exploring the events that brought the Kopps to their present circumstances, this is a hard world and it takes a certain kind of person to make it. But you wouldn’t know that from the narration, really — just as Constance maintains a proper disposition (or tries to) and manners, so does Stewart. It would’ve been very easy to turn this into something it’s not. Probably very tempting, too. It could’ve been all about the gender disparity of the time, and a feminist crusade. Or about the economics and labor conditions of the area and time — the strikes and the way they were dealt with by the owners and police. Or any number of other things, really. And it was about those things, but primarily it was a story. A decently told story with well-constructed characters. You give me one of those, and you can throw whatever politics, economic theory, etc. you want into the mix and I’ll read it. I may not buy everything you’re selling, but I’ll listen, and if your story and characters are good enough, I’ll come back. Too many people — particularly with historical fiction, it seems — will do okay with the story, mess up the characters, but nail the agenda. Stewart avoided those pitfalls, and thereby served her audience and any possible point she wanted to better. Now, while this is a novel, it appears that Stewart has done as much research as she could to make this as non-fiction as possible. I’ve wondered a bit about that approach, does that limit what parts of the story she tells? Which would account for some odd gaps. And if it does limit it — is that a good or a bad thing? Or does that depend on the writer? That’s probably it, for some writers, such a limit would be freeing, while others would find the restriction too much. Stewart, it seems, turns this into a strength — matching with her previous non-fiction publications. A fun little ride, full of historical nuggets, and a family you’d like to spend some time with. A little action, a little danger, but not a lot of violence. 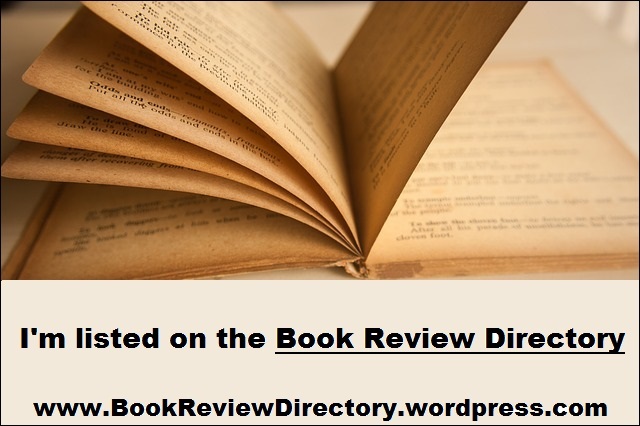 A pleasant mix of historical fiction and mystery. 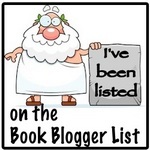 It’ll work for the cozy reader, the historical fiction reader, and people who just like good stories.